Beginning in 2015, the U.S. Department of Arts and Culture has led a project called the People’s State of the Union, to coincide with the president’s annual address to the nation. Taking the perspective that democracy is “a conversation, not a monologue,” the PSOTU is a chance for communities to come together and share the hopes and challenges they’ve experienced over the past year. After the Story Circle, hosts will have the option of uploading written transcripts or video recordings of the stories to an online Story Portal for others to read or view. The second part of the event is the Poetic Address to the Nation, which will take place at the Yerba Buena Center for the Arts in San Francisco on Saturday, March 11, 2017. For this portion, poets will perform a reading based on the stories collected from local Story Circles. You can check out video from last year’s Poetic Address here. 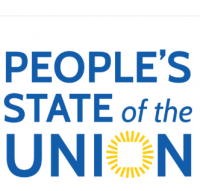 Will your community take part in the 2017 People’s State of the Union? Download the free toolkit from the USDAC and share your stories on social media using the hashtag #PSOTU2017.